I took another trip to the past yesterday. A local yarn store, the Knitting Worksphop, is having a moving sale, and I went. A note for Chicagoans: they are moving from their present location on Lincoln just north of Webster to Damen just north of Webster. But I can remember when the Knitting Workshop was the Weaving Workshop, owned and operated by Marilyn Murphy, the first editor of Interweave Knits and its current publisher. How's that for history? At that time the Weaving Workshop was on Sheffield between Fullerton and Diversey. That was where I bought the Harrisville yarn for the Fair Isle vest I blogged earlier this week. Judith Swartz, the designer and knitting book author, now based in Wisconsin, sold it to me. I remember it very well. The yarn was wound off from cones, and that was the first time I had seen a coned yarn. Of course, it was coned for weaving. I only need an ounce or two of each color, so Judith wound it off into skeins. She told me to wash the skeins before winding them into balls to get the bloom up and also, I suspect, to wash off the oil. 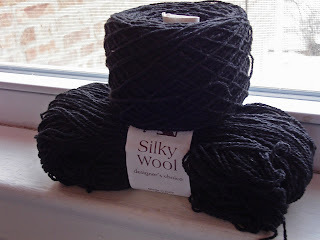 This is Silky Wool in black at half price. It isn't that expensive a yarn in the first place so, as I tell Roger, half price was practically free. I have 11 skeins. What to make? Maybe a Rowan sweater or a skirt I have an idea for. 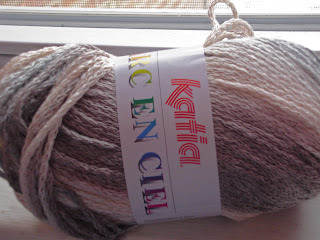 The other yarn I bought was Katia Arc en ciel (Rainbow? ), a variegated, worsted weight acrylic/cotton blend that was sort of expensive though put up in large quantity. I have had the idea of making a neutral colored Clapotis in cotton yarn, so I bought enough for that - four balls. I would like to have such a scarf, but I will save the knitting for a time when I will need a soothing project. I bet you think I'm a color bore, but hey, I'm not wearing bright purple or hot pink. Speaking of boring colors, and since this is a trip down memory lane, here is an ancient yarn that I bought in the little import shop on Ashalnd next to Weibolts. Do any old time north siders remember this shop? 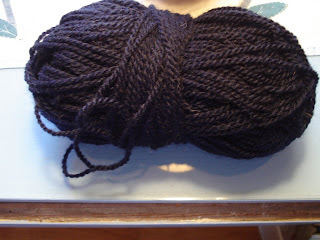 This yarn is the darkest of navies. I can't imagine what I was going to do with this or what I am going to do with it. I have about 850 yards. It is a light worsted weight with a twist, which would be good for stitch definition, except the color is so dark the stitches wouldn't show. I welcome your ideas.